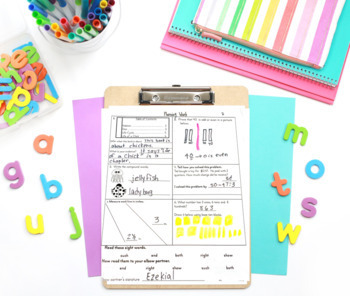 This morning work, designed for the sixth month of second grade, meets many Common Core Standards. For Math, it addresses 2. O.A.1, 2. O.A.2, 2. O.A.3, 2. N.B.T.1., , 2. N.B.T.2, 2.N.B.T.8, 2.M.D. 5, 2.M.D.6, 2.M.D.8, 2.M.D.10, 2. G. 1, 2.G.2 and 2.G.3. 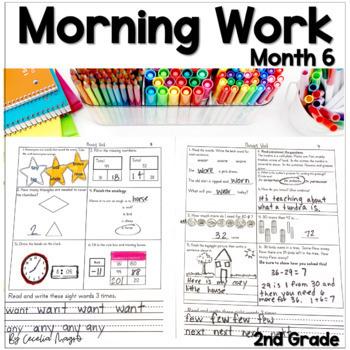 For language arts, Common Core ELA Standards, this month’s morning work addresses 2L.1.a., 2L.1.b., 2L.1.d., 2L.2.a., 2. R. F. S.3.a., 2. R.F.S.3.b., 2. R.F.S.3.e., 2. R.F.S.3.f., 2. R.F.S.4.a., 2.R.I.T.1., 2.R.I.T.2., 2.R.I.T.3., 2.R.I.T.5. and 2.R.I.T.6. It is mostly in black and white to save you money. *This product is part of a BUNDLE. You can save 20% if you buy the bundle. As always, please ask questions before purchasing. Thank you so much!